The Family Owen: Banana Anyone? I couldn't resist this picture! James LOVES his bananas. He has just finished eating (or so I thought) and I had gotten him out of his high chair and he promptly went to the table and grabbed the banana I had left too close to the edge and helped himself. Can you say big bite? so cute! he has great eyes. He is a monkey! Not just making the noises. So cute! 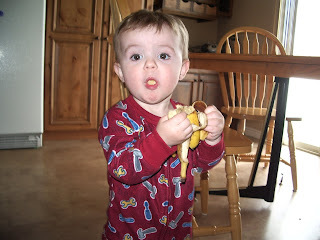 My Matthew loves bananas too! And, how funny . . . I'm re-reading all of Jane Austen's books too! I'm only on Sense and Sensibility though. But, my plan is to read all of them! Becoming Jane was good! I really liked it! Adorable. He really is. Thanks so much for the fun dinner. Next time we MUST go to the salon after and leave the kids with the guys! (Sorry -- David's in high gear mode with the basement). Loved your house -- it's beautiful. Thanks for the grand tour! And I love the hair highlights. I've always wanted to get some! If you find any more weight loss secrets, pass them along my way. You must have found some secret I'm still looking for 'cuz you look great! (I've still got 16 more to go). Congrats!